What To Do When Your Horse Is Coughing? Just as with people, horses may cough for a wide variety of reasons. Some are serious and some are benign. Do you need to call your vet every time your horse coughs? In this article we explore the phenomenon of coughing in horses and provide sound information to help you determine why your horse is coughing and whether it signals anything in terms of your horse’s health. Read on to learn more. 1 Does Your Horse Have A Fever? 1.1 1. Does my horse cough more indoors or outdoors or during certain times of year? 1.2 2. Does eating cause my horse to cough? 1.3 3. Does exercise cause my horse to cough? 1.4 4. Does my horse have a runny nose? 2 How Does A Vet Diagnose Equine Coughing? A cough accompanied by a fever can mean infection or even a tumor. If your horse is coughing, take his temperature a couple of times a day for a few days. If it is over 101.5 degrees Fahrenheit, you should call your vet. If your horse doesn’t have a fever, his infection may be caused by irritants in his environment. 1. Does my horse cough more indoors or outdoors or during certain times of year? Seasonal coughing or coughing that only happens in one location is probably caused by allergies. 2. Does eating cause my horse to cough? Coughing that is caused by eating may indicate a cleft palate or problems with the soft palate. 3. Does exercise cause my horse to cough? If your horse coughs during and/or after exercising, it may be a sign that he has a condition known as “exercise-induced pulmonary hemorrhage”. When this happens, blood may flow down the throat and cause the horse to cough. 4. Does my horse have a runny nose? 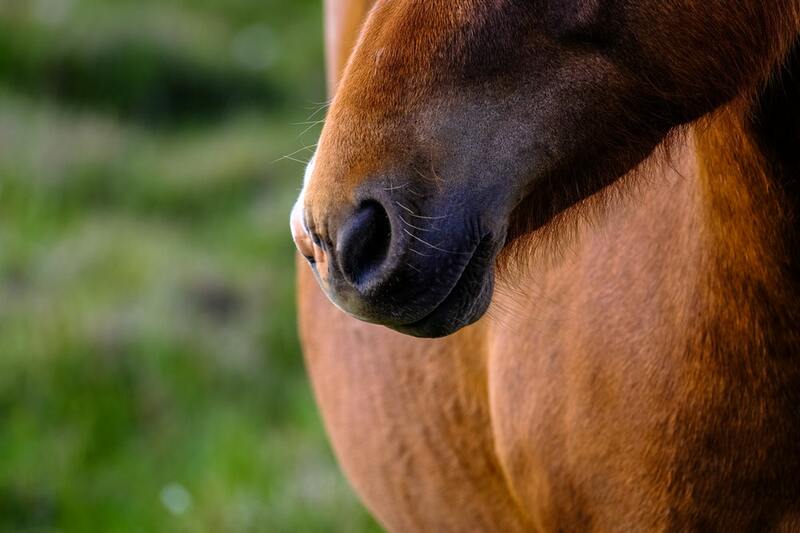 If your horse does have a runny nose, determine whether both nostrils are running or just one. Look at the discharge. Is it clear, or is it yellow, green or even bloody. Clearly, a thick yellow, green or bloody mucus discharge would give you cause to call your vet. 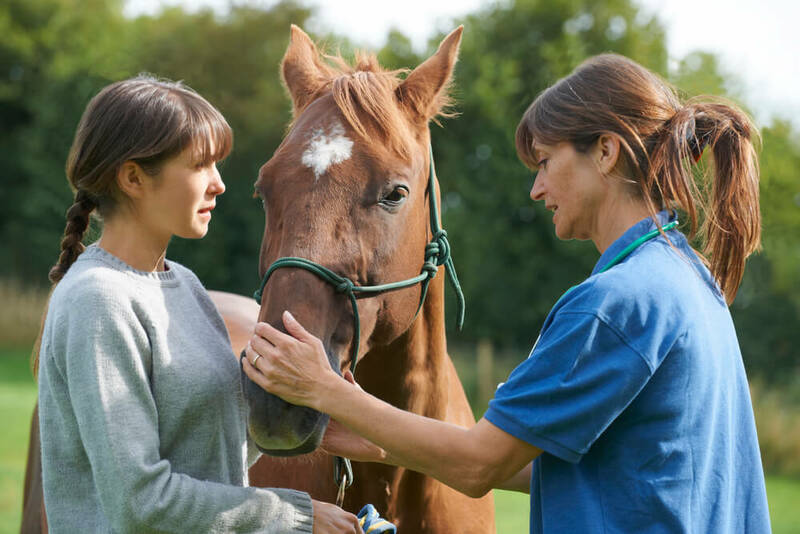 How Does A Vet Diagnose Equine Coughing? When your vet arrives, he or she will perform a complete physical exam. This will include using a stethoscope to listen to your horse’s lungs and heart. Your vet may hear abnormal respiratory sounds. If this is the case, he or she may tests, such as the transtracheal wash to identify infection or the broncheoalveolar lavage to identify airway and/or lung problems. The purpose of both these tests is to collect fluid samples for cell analysis. If your horse has a heart condition, inadequate pumping of blood can cause fluid to accumulate within the lungs. This can cause coughing. If your vet detects an irregular heartbeat (arrhythmia) it may be necessary to order an ultrasound. If the vet suspects lung or airway problems but cannot hear irregularities using a stethoscope, a thoracic ultrasound allows your vet to look into your horse’s lungs to see early signs of problems or hard-to-detect problems, such as a deflated lung or fluid accumulated in the lungs. If the ultrasound does locate fluid in the lungs, it will be easier for your vet to determine exactly where to perform a thoracocentsis to collect the fluid to be analyzed. Your vet may also use an endoscope to see into your horse’s upper airways, gutteral pouches and trachea. With an endoscope, the vet can send a very small camera into these areas to detect problems such as tumors, foreign bodies or tracheal collapse. Problems your vet may look for in the upper airway include anatomic defects that cause the airway to be inadequately protected from the entrance of debris. The gutteral pouches are air sacs that expand from a horse’s Eustachian tubes. They can be found just below the ears on the sides of a horse’s head. Your vet can use an endoscope to examine them for signs of fungal or bacterial infection. If your horse has a nasal discharge, your vet may call for x-rays to look for sinus infection. Sometimes the discharge from a sinus infection flows out of the nostrils and also down the throat. This can cause coughing. There are two illnesses that people often confuse, which cause coughing in horses. One is Recurrent Airway Obstruction (aka: RAO or the heaves). The other is Inflammatory Airway Disease (aka: IAD). 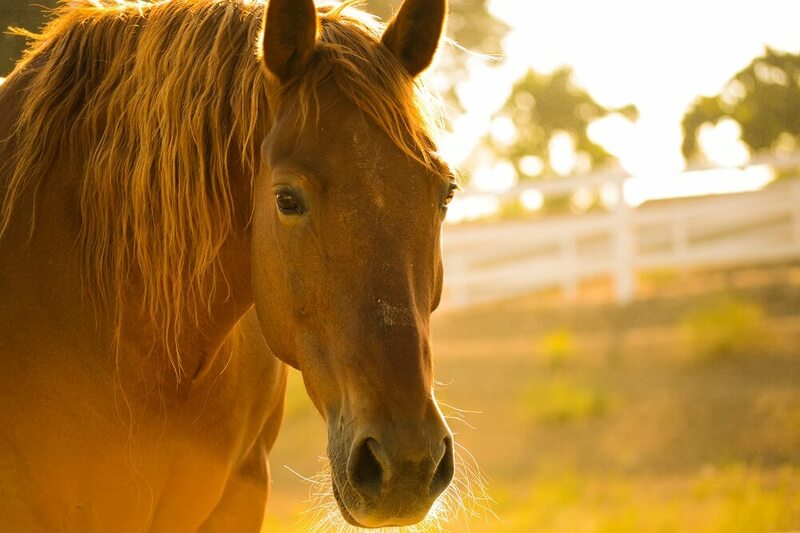 Most of the time, older horses develop RAO, which manifests as an increase in respiratory efforts in all circumstances and is accompanied by coughing. These horses cannot tolerate exercise, and the cough may be caused or exacerbated by exposure to dust or mold. This leads experts to believe that it is allergy-related. Generally speaking, younger horses develop IAD, which also manifests as exercise intolerance accompanied by coughing. The difference is that horses with IAD do not suffer from difficulty breathing while at rest. It is believed that IAD is also allergy-related. Both RAO and IAD can be treated with environmental adjustments and medication. If your horse is diagnosed with either of these conditions, treatment will begin with bronchodilators and anti-inflammatory drugs. These will help your horse breathe with greater ease. Turn your horse out when you are cleaning stalls. Provide your horse with a window in his stall. Store hay separately from the horse’s stall. Spray arena footing to settle the dust. Use non-dusty shavings as bedding. If your horse is coughing, quite a bit of testing may be necessary to determine exactly why. It’s all worth it, though. Attempting to treat a horse for a cough (or anything else) without fully understanding the cause can be a real waste of time and resources. Be sure to watch your horse carefully and take preventative measures to protect him from exposure to dust and mold. These steps will go far toward keeping him from developing a cough.